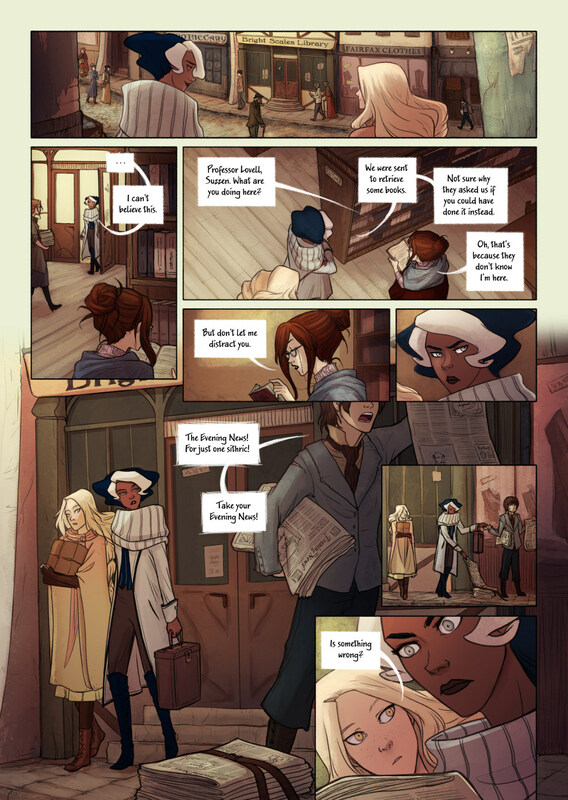 Is that Hedy smiling in the first panel? Nah, your imagination is playing tricks. Jokes aside, I might make a bookmark out of that panel one day. Hedy is not too happy about having to going to the other side of the city only to find Arabelia there. But she’s going to be even less happy about the news. Soo I’m starting to count pages and make calculations in order to ask for quotes for Bookwyrms’ first volume! I’m having doubts about the chapters distribution in the printed edition, because some of them are really short, and having a cover for every single chapter might get very repetitive. (There will be 18 chapters in this book!) At the moment the chapter division serves as a way of knowing who are the thought bubbles coming from, but I already got some feedback saying this is quite clear even without having to check whose character pov is being followed on the chapter covers. I’m going to check this myself and if I find that it’s true I might group some chapters together to make around 4 bigger chapters with cover illustrations. If any of you has thoughts on the matter I’d be very grateful to hear them, as any feedback will come a long way. Is Hedy’s lipstick missing in the first panel? You’re welcome! I almost didn’t say anything because I didn’t want to be a bother, but I thought that I should. Perhaps you could have four chapters (with cover illustrations) but keep the library lending card illustrations to divide the chapters into the POVs? That way you don’t have to have tonnes of chapters but you also get to keep the library lending card pages which serve as a clear indication of the POV switching. Good question! From what I’ve seen,what usually happens is that the author puts together a project to fund the printed edition using Kickstarter or similar pages, to ensure that there’s enough people interested in buying the comic. So it’s basically self-publishing 🙂 There’s also the possibility of printing a larger edition and having some on an online shop, and talking to distributors or bookshops to have your comics there too. Aand there’s fairs and comic conventions, where the author can sell the printed comics directly as well. Perhaps just have a thin ‘borrower label’ ident at the top of a new chapter? Don’t know if that would compromise the formatting of your art though. I don’t think the front page ever has good news. I really like the idea of the library cards at the beginning of each chapter because it is such a unique way to distinct new chapters, which I feel is very important. I will to brainstorm some ways that would remove those pages but make it obvious that there is a new chapter. If I think of anything, I will post again. However, I am very much looking forward to whatever you decide on! Oh, now that you say it, that’s true! I kind of almost forgot that the new POV has a few thoughts to distinguish the new chapter, but I especially hadn’t made the connection of the different colors. That was very smart of you to do! Best of luck deciding! I just spent a large part of my day reading your archive (If my wife asks, I was rescuing baby seals in Paraguay). This comic is great! I love the art, the characters, and the story! Please give me more!